The nightlife scene in Savannah has always been hot: to-go cups, tons of bars and clubs, and 80 degree midnights! Visitors to downtown Savannah at night are presented with live music, taverns, restaurants, nightclubs, and lively crowds in practically every section of town North of Gaston St.
Savannah has always been friendlier to night-time entertainment than many other cities. Bars close at 3am, and bar-hoppers can order a drink and take it with them anywhere in the “celebration district”. Try that in Charleston, Macon, or Jacksonville, and see how far you get! But a recent change to Georgia law has made it possible for two newcomers to make a big entry to the scene in Savannah. This is such a neat place! Located in a renovated warehouse along the Savannah River, next to River Street, Service Brewing Company is a brand new micro-brewery and bar. As the name implies, Service is dedicated to those who’ve dedicated themselves to service of country and community, and is owned by West Point graduate and former army officer Kevin Ryan, and his wife Meredith Sutton. The public areas of Service Brewing Company are wide, open, airy, and modern. The owners have cleverly re-purposed shipping containers for the bar area, which is the focal point inside. The Saturday evening we were there, a blue grass band was playing, and there was a very good crowd. The selection of beers is extensive, and easy to understand. We tried a Blueberry Pilsner, and a Mocha Frappucino Porter, which tasted exactly like an alcoholic coffee! But for those with less adventurous tastes, Service Brewing has less exotic flavors, all which were excellent. The front-of-the-house has bar seating, table seating, couches, board games, darts, and an outdoor hang out area. 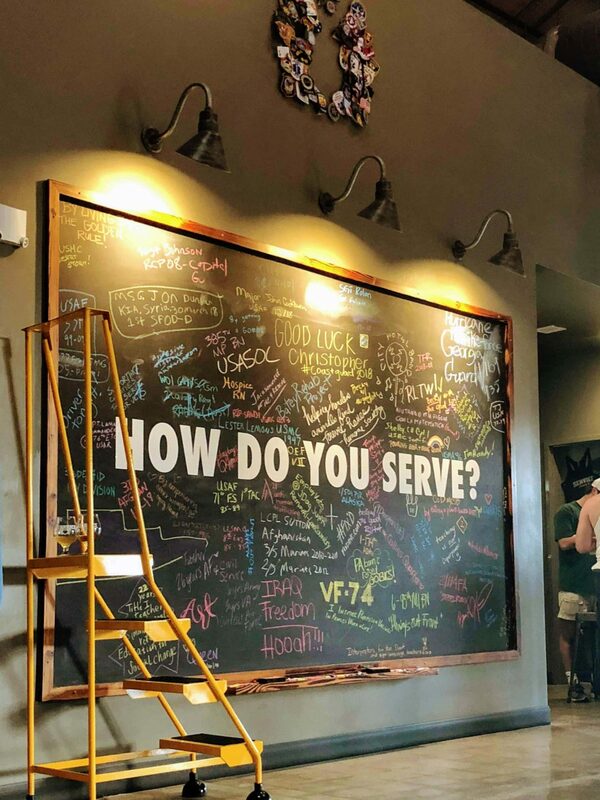 Check out the “How Do You Serve?” chalkboard to see the stories of other patrons. But the action is in the back-of-the-house. Service is a full-functioning brewery after all, and the stainless-steel vats and equipment on site are impressive and overwhelming. It’s here that the R & D arm works on experimental brews, seasonal batches, and year-round production beers, which you can enjoy at the bar, or buy at your local package store. Out back, are the Brewery Bees, housed in a small apiary. Service Brewing takes cuttings of the honeycombs produced by the “Brewery Bees” to create a totally original house yeast strain. A portion of every sale goes to charities that support U.S. veterans, police, and firefighters. Look for Service Brewing Company beers next time you’re searching for something new! A lot has happened since 1733, when Savannah’s charter prohibited lawyers and liquor! Downtown Savannah is home to both kinds of bars, with lawyers and watering holes in abundance. In the centuries that have passed since General Oglethorpe founded our city, Savannah has become famous for being one of the most haunted cities in America, and the capital of the “Ghost Coast”. 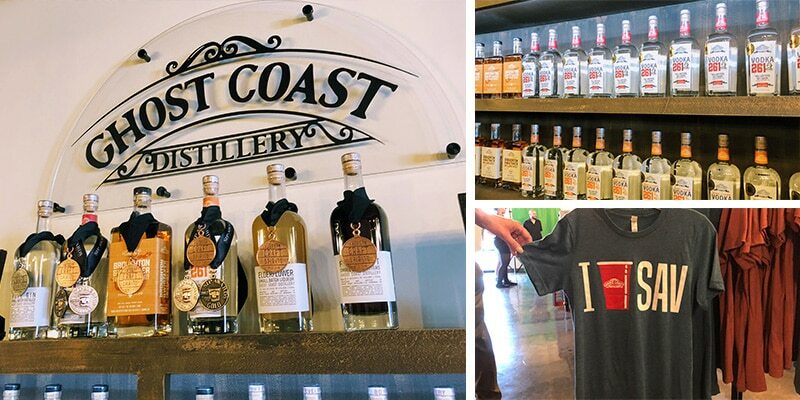 Serving spirits and “Spirits”, Ghost Coast Distillery is another new entrant to Made-In-Savannah nightlife. 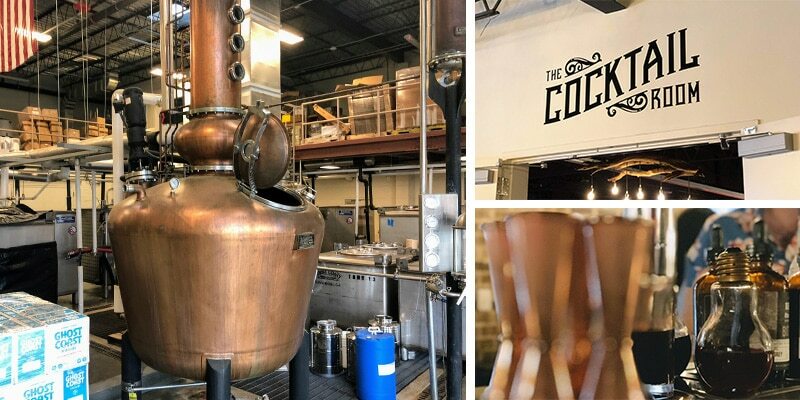 Located at 641 Indian Street, right down from Service Brewing Company, Ghost Coast manufactures premium vodka, bourbon, gin, and more in their state of the art 17,000 square foot facility. Free tours are given every day but Monday, and the upscale bar and dance floor come alive at night. 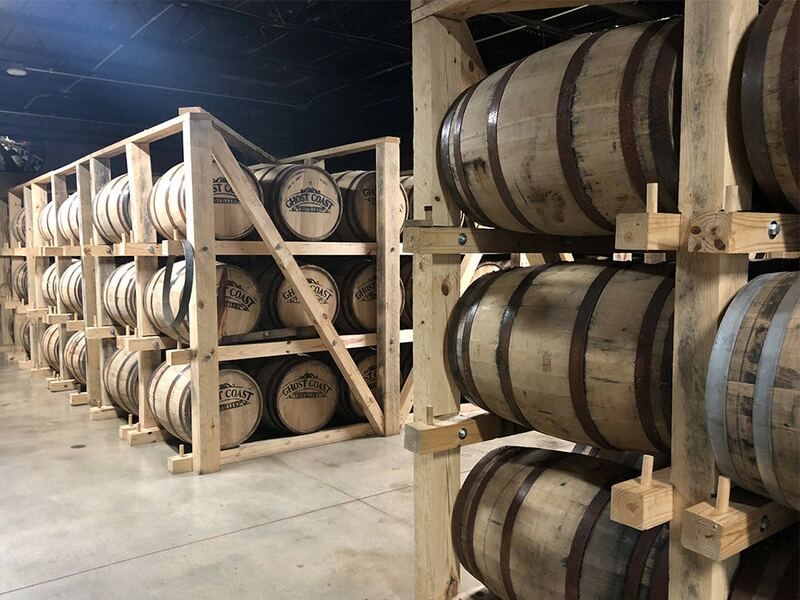 Ghost Coast can age 900 barrels at a time. Founded by Savannahians Chris Sywassnik and Rob Ingersoll, Ghost Coast is an ultra-modern distillery, using time honored methods to create unique super-premium spirits. At the bar, we met Sidney Lance, the Beverage Director, whose title should really be “Mix Master”, to try a few of Ghost Coast’s signature drinks. The night we were there, a DJ was playing, and the vibe was really fun. Oglethorpe’s Mule, the Ghost Coast Basil Sour, and the Ghost Coast Greyhound were all delicious, and you can sample a flight of “Savannah’s finest craft spirits”. Looking for things to do at night in Savannah on your next vacation? 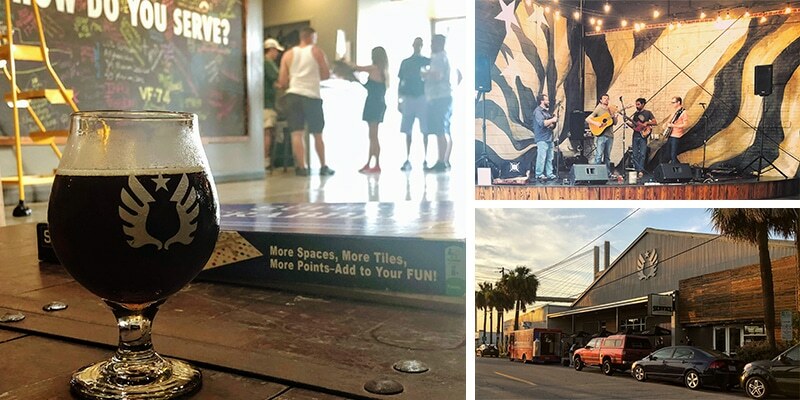 Check out Ghost Coast Distillery and Service Brewing Company, for a Made in Savannah good time!